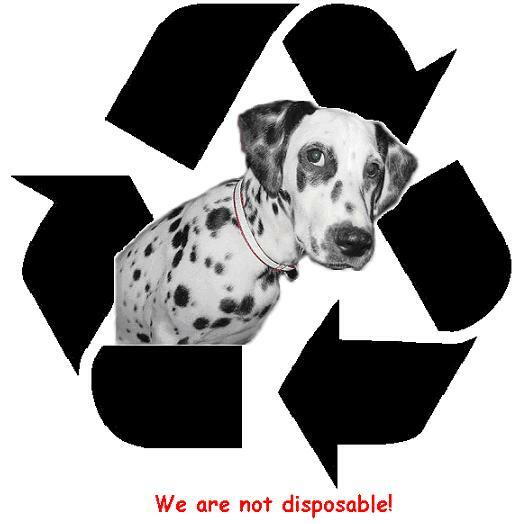 Recycled Canines Dalmatian Rescue is officially an IRS 501(c)(3) nonprofit organization. We are dedicated to saving the lives of the many homeless Dalmatians around Houston, Texas. However, we usually have a few canines without spots as well. Our mission is to take dogs from shelters, as strays, or from owners that can no longer care for them and provide them with indoor shelter, high quality food, water, microchipping, spaying/neutering, vaccinations, training, exercise, socialization, and lots of TLC. Once we deem the dog ready for a new home, we seek permanent homes for them with people that have filled out an application and have been screened for eligibility. RCDR has many advantages to offer over some other rescues. Our dogs are NOT kept in kennels. They live in our foster homes, they get basic obedience, good dog food, and they are well adjusted family members with house manners. We limit our numbers so that we can get to know the personalities of the available dogs in our program. We use this to match a dog to the right family. How do we do this? We foster dogs in our homes, ourselves, and we have many volunteer foster families that also offer this service to our dogs as well. Dogs Available and also see how our Adoption Process works. We have adoption events where you can come out and view the dogs that we have available for adoption. If you would like to help out, but cannot adopt or foster, please look into the other volunteer opportunities that we have. We also have a Sponsor a Dog program where you can donate money to help a specific dog that will have high veterinary bills. If you have found a Dalmatian or are looking for a home for your own Dalmatian please visit our Rescue Resources page. Please understand that we cannot save every Dalmatian. Dalmatians in shelters have a higher priority than others and there are ALWAYS Dalmatians in shelters. We do not have enough foster homes or money to save them all. Located in League City!! Sea Dog Inn generously provides boarding for a lot of local area rescues. Thanks you! and has been viewed times since.